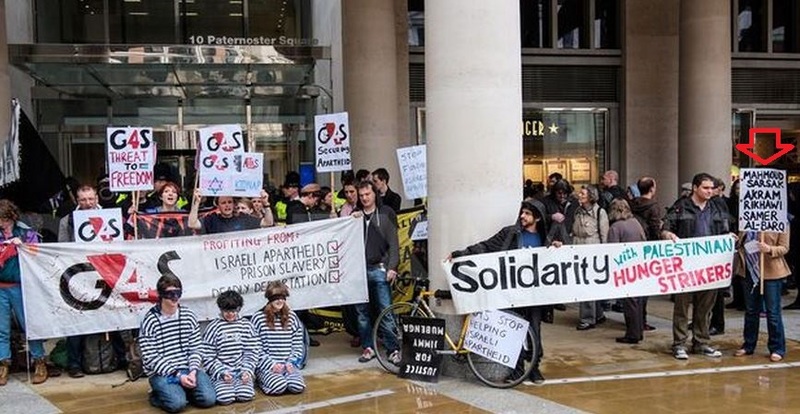 A story in the Guardian by Jennifer Rankin on June 6th, titled ‘Israeli prison contracts take centre stage at G4S shareholder meeting‘, highlighted questions raised by some at the annual meeting of G4S – a British multinational security services company – regarding their business in Israel. G4S, Rankin notes, employs 620,000 people in 125 countries, including some in Israel, but that they recently announced they were pulling out of providing services in the West Bank beginning 2015. The company, however, will continue to run prisons inside of the green line. Rankin quoted one wild accusation about the treatment of Palestinian children in Israeli prisons by one unnamed shareholder and provided an additional quote from shareholder John Hilary, executive director of the radical anti-Israel NGO War on Want. 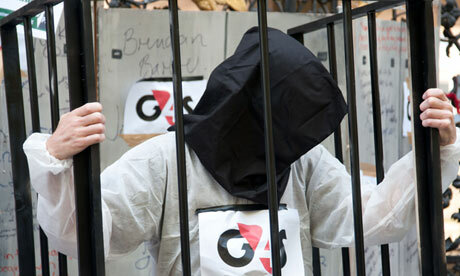 The story also featured the following photo from an anti-G4S protest outside the meeting. Note the reference to Mahmoud Sarsak on the sign to the far right. Sarsak is a Palestinian ‘hunger striking’ (football playing) prisoner who has become a cause celebre among activist journalists (at the BBC, the Guardian and elsewhere) despite the fact that he has admitted being a member of the terrorist group Palestinian Islamic Jihad. As CAMERA recently documented, radical NGOs and Palestinian Authority sites often use the euphemism “political prisoners” to refer to even those Palestinians convicted of violent acts, including lethal terrorist attacks on innocent Israeli civilians – an egregious distortion of a term which is widely understood as referring to those imprisoned merely for their political beliefs. Evidently, for these G4S protesters, other pro-Palestinian activists and the media outlets which regularly champion their cause, the ‘human rights’ of Israeli victims of Palestinian violence never quite seem to inspire such displays of “liberal” sympathy. Well, I hope the protestors enjoyed their little day out. They could give the whole getting a life thing a bash at some stage. As expected, no evidence was provided to back up this claim. For what it is worth, herewith B’Tselem’s latest figures for minors in custody. Note, solitary confinement is not mentioned- and certainly would have been, had it been in operation. B’tselem doesn’t look at the conditions of these prisoners, but a lot of other NGO and other observers have done and report on what they find. In 2012, around 600 Palestinian children were arrested by the Israeli military. … There has been no change in the way Palestinian child prisoners are treated during the various phases of arrest, pretrial detention, interrogation and imprisonment. And the source of this alleged information is what exactly? Without which I will take everything you write with a large pinch of salt as you have demonstrated that you are not to be trusted because of your extreme ignorance and the fact that you are a pathological liar. Little innocent terror bunnies, good for PR, bad for intelligent life. Far right or far left? It’s so hard to tell these days. War on Want, I remember them a few decades back when they had an ‘up and coming’ wannabe politician as General Secretary, now what was his name? Ahh yes now I remember George Galloway. I wonder what happened to him. You won`t believe it how quickly a cultural relativist changes spots and argues for a free society unless it is related to Islamic societies. The point he avoids is why, if so perfect, Newton, Woolwich etc. Unless there is a sinister purpose …. and there he is. You cannot argue with fanatics about human failure and the limitations of electronic surveillance, as f.e. wikileaks and the motivation of Manning and others. We cannot exclude political notivations for this revelation, f.e. a republican revenge. What is astounishing is the oblivioun of the cold war surveillance, under the UKUSA agreement. France and the Sovietunion had their own network. “On May 20, he boarded a flight to Hong Kong, where he has remained ever since. He chose the city because “they have a spirited commitment to free speech and the right of political dissent”, and because he believed that it was one of the few places in the world that both could and would resist the dictates of the US government. To choose Hongkong, part of Communist China, politically and economically concurring with the USA, host of cyberattacks and espionage against the west and foe of free speech, free unions, free internet is somehow weird and contradicts his assertions. Reminds of Assange working as host for Russian tv. Let me know when they publish a comment piece by you an extreme pillock,or if you ever write anything sensible that would be an extreme novelty. But, I must compliment you on your choice of name ‘Sanity’, clearly evidence of an extreme sense of irony. Oh, the Knight of Hypocrishire is back. Lots of fun ahead. When is the PA going to start paying suicide bombing victims to Israeli families? Its time we stop playing morality and humanity with these evil selfish people. Despite the Palestinian Authority’s financial hardships, it spends tens of millions of shekels each month paying salaries to prisoners held in Israeli jails for security offenses and acts of terrorism against Israel — including mass murderers — and last year Prime Minister Salam Fayyad tripled their monthly pay. The PA also pays monthly stipends to the families of suicide bombers. Payments are made not only to members of Fatah, the political faction of PA President Mahmoud Abbas, but also to those of his bitter Islamist rivals from Hamas, and other factions. As of May 2011, the PA spent NIS 18 million ($4.5 million) per month on compensating Palestinian inmates in Israeli prisons and a further NIS 26 million ($6.5 million) on payments to families of suicide bombers. In all, such payments cost the PA some 6 percent of its overall budget, Israel’s Channel 2 news reported on Monday night, citing documentation signed by Fayyad. The PA also makes payments to Israeli Arabs jailed for security offenses against Israel, the report said. Starting in 2003, Palestinian law mandated the dispensation of a monthly salary of NIS 1,000 ($250) to security detainees sentenced to up to five years in prison. The longer the sentence, the higher the pay. An inmate serving a life sentence was paid NIS 4,000 ($1,000) per month. An amendment of the law in January 2011 enacted by Fayyad increased the salaries by up to 300%, Channel 2 reported. A prisoner sentenced up to three years in prison now receives a base salary of NIS 1,400 per month, and for 3-5 years that rate increases to NIS 2,000, the report said. A NIS 300 bonus is added for a wife, and NIS 50 per child. According to the Channel 2 report, the PA-funded salaries are an equal opportunity benefit; members of Fatah, Hamas, and Islamic Jihad all receive them. Prisoners’ salaries also increase based on how many years they have served. Abdullah Barghouti, a Hamas bomb-maker who was sentenced in 2004 to 67 life terms for orchestrating the killings of 67 Israelis, receives a monthly stipend of NIS 4,000. In less than a year that figure will rise to NIS 6,000 ($1,500). Another major Hamas terrorist figure, Abbas al-Sayyeed, convicted of planning the 2002 Park Hotel massacre, in which 30 Israeli civilians were killed as they sat down for a Passover meal, is paid NIS 12,000 ($3,000) per month. Prisoners who have sat more than 30 years in Israeli prison receive NIS 12,000 per month.